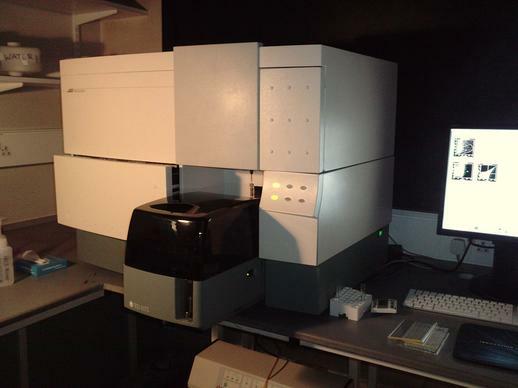 BD FACSCalibur is a 4-colour flow cytometer. Our FACSCalibur is attached to a plate-loading syringe-driven sample mixing and injection throughput system. This means it is able to analyse single cells one-by-one in suspension in a standard FACS tube or in smaller sample volumes (10 to 200 MicroL) in a standard 96-well plate at acquisition rates of up to 15,000 events per second. Our model has a 488 nm blue laser allowing 3 colours detection (530/30, 575/26, and 650LP filters), and a 635 nm red laser that enables 1 colour detection (670LP filter). FACSCalibur is especially convenient for high throughput screening and high- content analysis of cells and analytes (proteins).